DesertXpress Enterprises renamed its Las Vegas to Southern California high-speed rail service “XpressWest” to more accurately reflect its role as the first leg of a larger western high-speed passenger rail network. 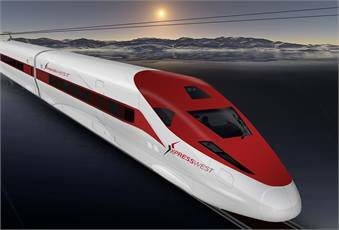 XpressWest is an exclusive, dual-track high-speed train which will be the most advanced and fastest in the U.S. With a top operating speed of 150 mph, the service will reduce travel between Las Vegas and Southern California to 80 minutes at an average cost of $89 for a roundtrip ticket. XpressWest is the only construction-ready dedicated high-speed rail project in the U.S. as it has completed all of its permitting requirements and has applied for a Railroad Rehabilitation & Improvement Financing loan established through Federal Rail Administration in 1998, according to officials. Once the loan is approved and secured, XpressWest will be the first high-speed rail project developed in the U.S.